On the curtain tape draw in the three cords on the side of the curtain by about 10cm. Tie the three cords together, into a knot. Then draw in the three cords from the other side, to gather the curtain to the desired width, spacing out the pleats evenly as you do so. When the pleats are evenly spaced, tie the three cords on this side. Insert plastic hooks into the top woven pocket on the tape approximately every four pleats. The hook is inserted upside down and turned over. Once all hooks are in the curtain, attach the hook to the track, by slipping the hook into the track glide. NB: If height needs adjusting, change the placement of the hook in the tape pockets - up or down. 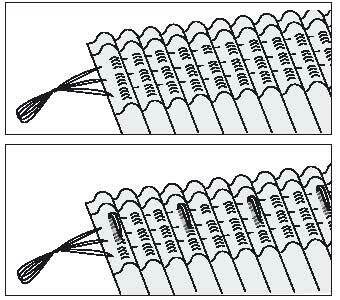 If the width needs adjusting - either gather or ungather the curtain tape - using the three cords.